Emil Frey Jaguar Racing experienced a true rollercoaster ride at the season-opener of the Blancpain GT Series Endurance Cup in Monza (Italy). 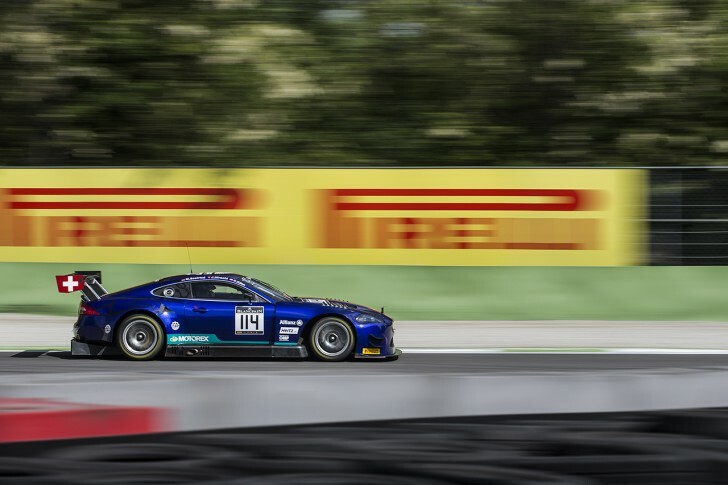 Following competitive lap-times in both Free Practice and Qualifying, the great performance of both GT3 Jaguar could not be converted into satisfying point-results in the three-hours of Monza. After a turbulent race, both cats did not see the finishing line. The Swiss team set all hopes into the opening round of the Endurance Cup in a bid to end the enduring string of bad luck at the Autodrome Nazionale Monza. The intensive work over the winter paid already off during the free practice sessions and pre-qualifying. With competitive lap-times, Emil Frey Jaguar Racing was able to fight with the big teams. However, due to BoP regulations, the GT3 Jaguar were the second heaviest cars in the entire field of 54 cars. With P17 (GT3 Jaguar #114) and P22 for the #14 GT3 Jaguar, the hoped for qualifying positions were not met and the team hoped for the race, knowing well of the cat’s strong performance in the long-runs. Right at the beginning of the race, there was a heavy accident with a number of cars towards the first chicane, in which the #114 suffered severe damage to the left-hand-side of the car. The mechanics used the 30-minute break of the race to repair the damage as best as they could. Despite all efforts, the car did not get out on track at the re-start and lost six laps to the front. The sister car (#14) was luckier and could start the race again from 22nd position. Ortelli put down a fantastic stint with twelve overtaking moves and handed the GT3 Jaguar #14 to Lorenz Frey from 10th place. Frey also had a strong stint until Albert Costa Balboa took over the car for his stint in P12. A technical problem ended the great drive 45 minutes before the end of the race, with Costa Balboa having to stop the #14 Jaguar in the second chicane out on track. The sister car suffered bad luck once again: 300 metres after passing the entrance to the pitlane, the car had another tyre puncture front left. Marco Seefried lost a lot of time bringing the car back into the pits on a slow lap. After the tyre change, team-mate Jonathan Hirschi took to the wheel in the #114. But there was a further tyre problem in the following stint and the team was forced to retire the GT3 Jaguar. So once more, the team did not see the finishing line in Monza. After great performances and consistently strong speed, the Team from Switzerland did not reach the deserved results.